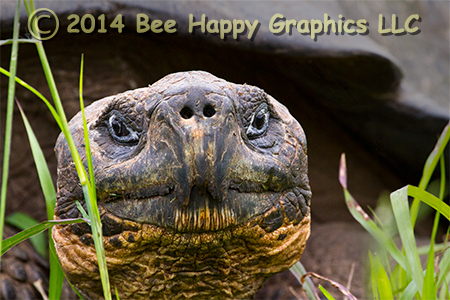 Each of the Galapagos Islands of Ecuador has its own species of giant tortoise. This close-up photograph of a Santa Cruz Galápagos tortoise (Chelonoidis porteri) was taken from less than 14 feet away in the highlands of Santa Cruz Island. We photographed a number of tortoises that morning, but this one seemed to be the oldest. Photographic details: Canon EOS 7D camera w/ EF 100-400mm f/4.5-5.6L IS USM lens set at 400mm. Flash was not used. Camera was set for f/8 on aperture priority, resulting in a shutter speed of 1/400 sec at ISO 1600. Fine Art Paper 11" x 161/2" 19" x 29"
Canvas N/A 25" x 38"